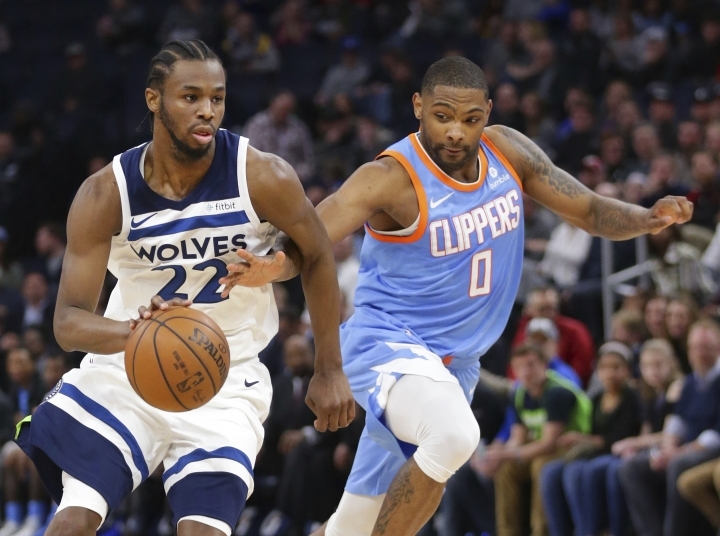 MINNEAPOLIS — The intensity for Andrew Wiggins and the Minnesota Timberwolves that has been inconsistently present with Jimmy Butler out was on full display. This critical matchup with the Los Angeles Clippers brought out their best. 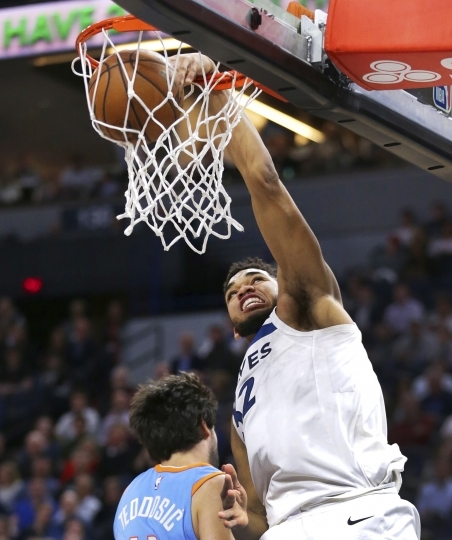 Karl-Anthony Towns racked up 30 points and 10 rebounds for his NBA-best 60th double-double and Wiggins scored 27 points in an all-around performance, leading the Timberwolves to a 123-109 victory on Tuesday night that stretched their lead over the Clippers to three games. "It's just desperation," Wiggins said. "We know that we needed this game. They're right behind us." Jeff Teague pitched in 20 points and 12 assists for the Timberwolves, who swept the four-game season series and sent the weary Clippers to their fourth consecutive loss on the commencement of a four-game, six-night trip. "Everybody had to be in. You can't have half the group playing with urgency, half the group not playing with it," Clippers sixth man Lou Williams said. 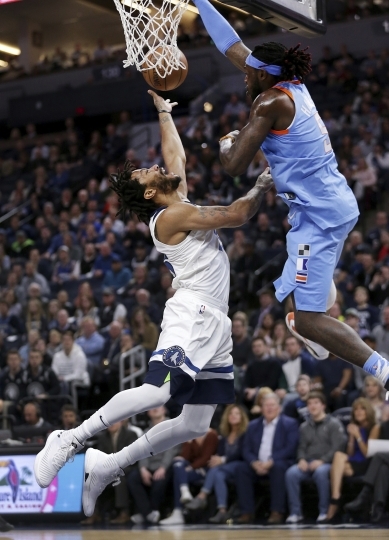 Jamal Crawford scored 20 points on his 38th birthday and Taj Gibson had 15 points as the Timberwolves (41-31) crept into seventh place in the Western Conference, one-half game behind New Orleans and San Antonio and one-half game ahead of Utah. Denver (38-33) is ninth. The Clippers (37-33) dropped to 10th place. DeAndre Jordan led the Clippers with 18 points and 12 rebounds, but Tobias Harris played with flu-like symptoms and finished with only 10 points on 5-for-16 shooting, missing all five of his 3-point tries. "I just felt like I've got to be there for my teammates, and whatever I could bring, just bring it," Harris said. "That's it. It was a rough night." 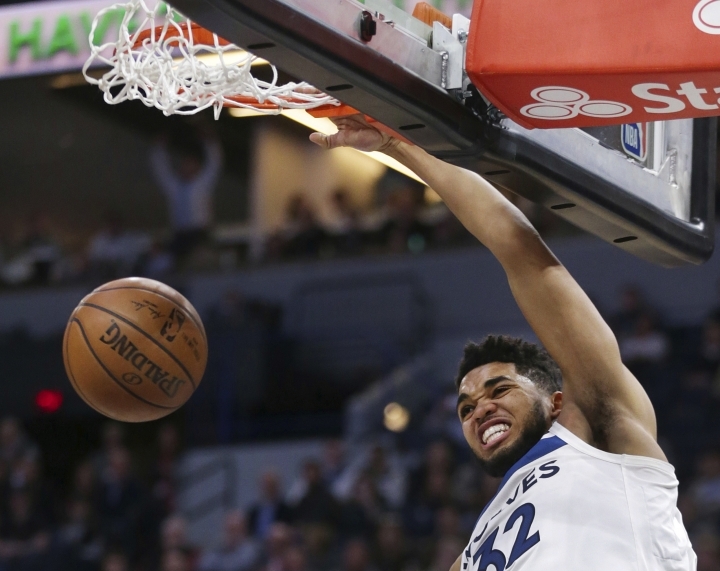 Neither team led by more than six points until the Wolves awoke early in the third quarter and used a 13-0 run to build a 72-59 advantage. Just as they did on Sunday night to make a noncompetitive matchup Houston close in the waning minutes after the Rockets agitated them with some rough stuff, the Wolves snapped back when the Clippers engaged them in some extra-physical play. Towns took his share of hard contact underneath by the much burlier Jordan and Montrezl Harrell. Gibson and Teague each had blood drawn by inadvertent elbows or forearms to the face. "They noticed that it was a physical game, and they went out and got more physical," Clippers coach Doc Rivers said. "We went the other way." The Wolves are 5-5 without Butler, who's out following knee surgery. Wiggins made all three of his 3-point attempts in the third, and he matched his career high with three blocks while displaying energy and hustle on both ends of the floor. At one point in that quarter, he harassed Austin Rivers from end to end and nearly stole the ball from the coach's son, an effort that brought the crowd and the team to life. "He's one of those guys who doesn't show a lot of emotion, but when you see him make a play like that, you get excited," Teague said. Wiggins has scored 20 or more points in nine of his last 11 games, going 21-for-45 from 3-point range in that span. "I believe in him. I think our whole team believes he can knock down 3s," Teague said. Said Gibson: "If you want to go to the playoffs, you've got to grow up. Plain and simple. He's been doing a good job." The Clippers, who have recovered deftly from their 8-15 start and withstood the departure via trade of former franchise cornerstone Blake Griffin, have left themselves with no room in this postseason race for even a mini-slump. After praising his team's competitiveness amid the slew of injuries before the game, Rivers called this defeat the most disappointing of the season. He removed his starters with 7:24 remaining. "There was going to be no magic wand. I figured, take them out," he said. 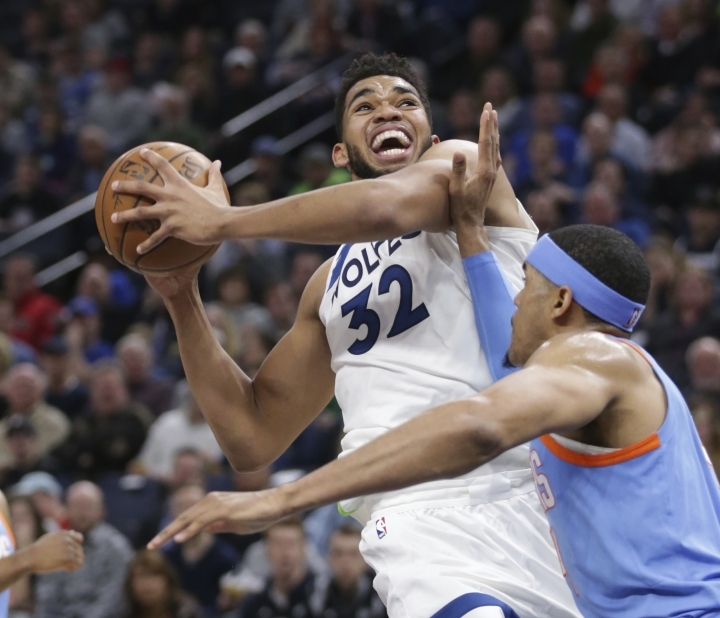 The Timberwolves have the schedule in their favor in their quest to make the playoffs for the first time in 14 years, with eight of their final 10 games against teams below the cut for the postseason. They play Denver twice, but there are six other matchups against opponents whose next drama will be the draft lottery. The Clippers have 12 games left, with nine against teams on a postseason track plus one against the Nuggets. This matchup in Minnesota began a stretch of six out of seven games on the road. Denver also has a difficult remaining 11-game slate, with only two matchups, Wednesday at Chicago and April 7 at the Clippers, coming against opponents currently outside the top eight in either conference. The Nuggets, too, have five stops left on a seven-game trip to finish the month. Clippers: Jordan's streak of 15 or more rebounds ended at 10 straight games, which matched the longest run of his career and the most by any active NBA player. ... Harrell, who had 24 points against Portland on Sunday and was in double digits in 24 of his last 30 games, had nine points on 3-for-9 shooting. 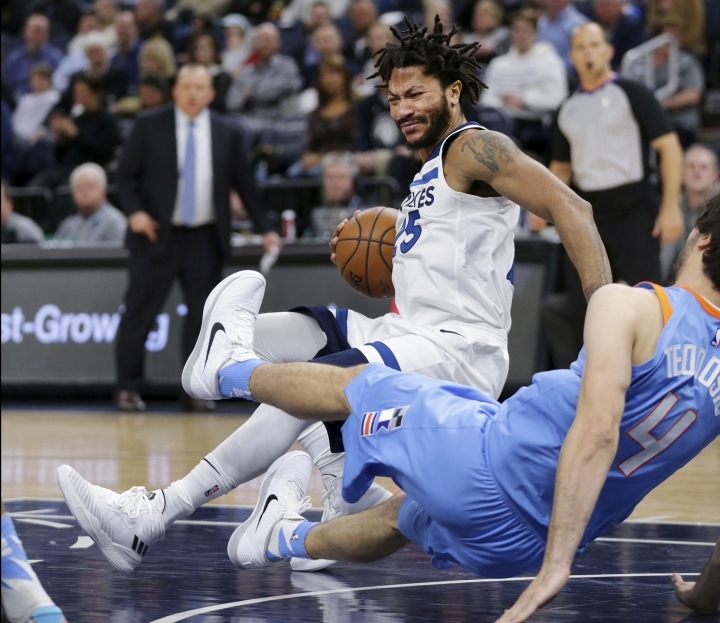 Timberwolves: Derrick Rose, who had nine points in six minutes, sprained his right ankle in the second quarter and didn't return. Rose, who joined the team less than two weeks ago, had 14 points in 19 minutes against the Rockets. ... The Wolves are 9-3 when Teague has 20 or more points. ... The Wolves swept the Clippers two other times in franchise history, in 1997-98 and 2003-04. Clippers: At Milwaukee on Wednesday night. Timberwolves: At New York on Friday night.